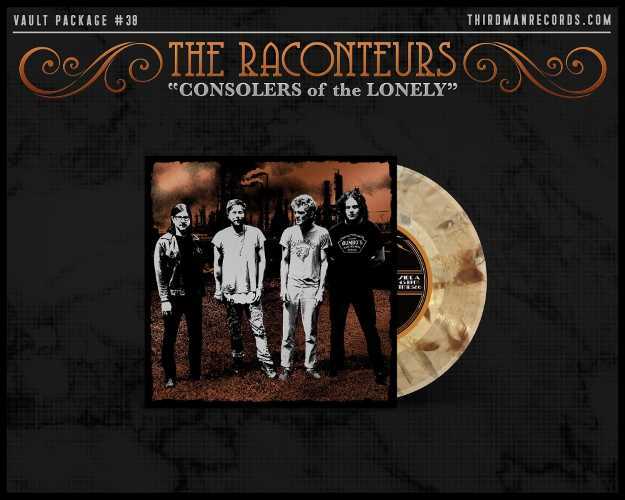 LOS ANGELES, Oct 10 - Jack White's group the Raconteurs have announced a ten-year-anniversary reissue of Consolers of the Lonely, and they're including two brand-new songs, with a full album to follow in 2019. The news was revealed by White's Third Man Records, which is behind the reissue of the 2008 LP. The Raconteurs formed in 2005 as a supergroup consisting of White (the White Stripes, the Dead Weather), Brendan Benson (solo), Jack Lawrence (the Greenhornes, Blanche and the Dead Weather) and Patrick Keeler (the Greenhornes). They released a debut album in 2006, then Consolers of the Lonely two years later, and while they've since performed live together, no new music followed. Consolers of the Lonely, whose title comes from an inscription on the frieze of a Washington DC post office, finds the band channelling the sound of a classic rock band, with "full-on bombastic horn arrangements and gut-wrenching murder ballads" and "the swagger and confidence of riffs and licks for days," as Third Man describes it. The reissue will be pressed on copper foil vinyl with a slightly reimagined front cover that adds metallic accents to the original tintype image. But the big surprise revealed by Third Man is that the reissue package will include a 7" featuring two new Raconteurs songs - the band's first in ten years, recorded in recent sessions and heralding a new Raconteurs album in 2019. No details of the new songs - not even their titles - are being revealed ahead of the package drop.